Tipping in New York is a regular part of daily life. It seems as if New Yorkers are constantly tipping. You tip in a restaurant, in a bar or club, in a cab, in a beauty salon and even when someone helps you with your luggage. 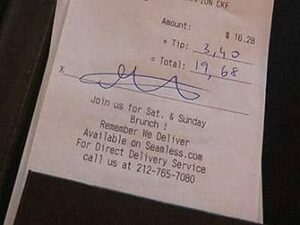 Tipping in New York is not only a sign of appreciation of good service but is a normal fee to be paid on top of the bill. New Yorkers are good tippers and usually won’t tip less than 18% in restaurants. Tourists visiting New York are not always accustomed to tipping. To make tipping easier during your stay in the Big Apple I have collated some tips here. Tipping in restaurants in New York is very important. Tipping makes up an essential part of the wages of the personnel. It is very common that restaurant workers are paid under minimum wage and it is expected that tips subsidise their salary. So please don’t forget to tip your waiter. An easy way to calculate the tip is to double the tax. In New York City restaurants it is customary to tip 20%. New York City local tax is 8.875% making it easy to simply double the NYC local tax and round up. There is a lot of debate whether you should calculate the tip on the amount before or after tax. Majority of the people tip on the total amount (tax included). Some of the finer restaurants might have a bathroom attendant working in the toilets and they also expect a tip of $1-2. Coat check tip is $1. 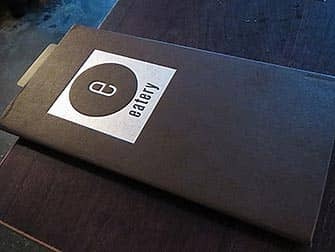 Sometimes tip is already included in the customer’s bill as a “service charge” or “gratuity”. This might happen if you are dining with a group of more than 5-6 people or in a very touristy area. Always read your bill carefully. You can expect the service charge to be around 18%. You ask your waiter for bill or check or simply say you would like to pay. The waiter will bring you a bill on a plate. The bill might also be given in a little booklet. Always check it carefully first. Usually, you will need to calculate and add the tip to the total amount yourself. Sometimes, you’ll be given suggestions of 15, 18 or 21% tips. Alternatively you can tip in cash (no coins) and write “cash on table” on the receipt. Put your credit card on the plate or in the booklet. 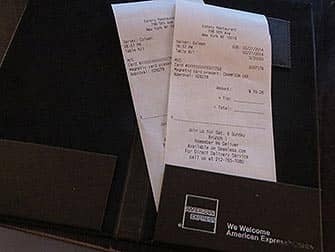 The waiter will take them, process your payment and return with a receipt for you to sign, a copy for yourself and your credit card. It is perfectly safe to use your credit card in New York in every restaurant. They will not overcharge your card. Keep a copy of the receipt and write down the total sum on it. In self-service places it is common to round up the sum instead of leaving a separate tip. In a bar you can tip $1-2 per drink and leave it on the bar. In a New York cab it is common to round up the sum on shorter rides or tip about 10-15% of the bill on longer rides. It is always smart to have some cash ready when you arrive in New York. Even when you have planned ahead and pre-booked your transport from airport to your hotel, the driver will still expect a tip. Tipping is also expected at hotels in New York. If the staff help you carry your bags they expect $1-2 per bag. If the doorman hails a cab for you, you should tip him $1. The housekeeper might also expect $1-2 for a couple of nights of cleaning assuming the room was clean. One of the best ways to get to know New York is by taking a guided tour. As a general rule if your tour has a guide, they expect a tip. If you tour on a bus, the chauffeur also expects a tip, $5-$10 is a nice tip. This, however, excludes the Hop on Hop off Bus Tour. New York offers you great opportunities to enjoy beauty treatments at very good prices. There are nail and hair salons on every corner and many allow you to pop in without making an appointment. Your nail stylist expects a tip of 15-20%. The same applies at the hair salon: There, you might also tip the person shampooing your hair $2-5. If you are unsure, you can always ask the staff. You are almost always expected to tip in cash. Eric’s Tip: Tipping is very personal and this is how I, as a New Yorker, and my friends would tip. There are many debates surrounding tipping and you should consider the above advice as a guideline. You should tip as you feel comfortable, but do remember that the wages depend on tipping.